Ancient Egypt Gods - One For All Occasions. When the onset of farming freed the hunting man's time up a little, it seems he did more thinking. His thoughts turned to matters more otherworldly in nature. Somewhere the notion was born that blood, sweat and tears alone did not bring man success in his endeavors. There must be something or someone less earthly, more powerful and more divine out there to bring good fortune. And they must be respected. And now for the age old question. What came first? The chicken or the egg? Hmmm. That one still has us baffled. What about this one. Did the gods create man or did man create the gods? This one may be a little easier to answer. Especially in ancient times. The fact that ancient Egypt gods seemed to suit whatever the pharaoh of the day believed, makes them seem very man-made. The Birth of the God's. Out of the dark water's of chaos rose a hill. On this hill stood Atum, the first god. From Atum's spit two more god's were formed. Shu the god of air and Teftnut the god of moisture. 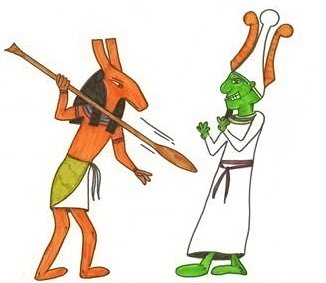 Shu and Teftnut had two children; Geb the god of Earth and Nut the god of the sky. Shu lifted Nut up and she became a canopy over Geb. Nut and Geb had four children named Osiris, Isis, Seth and Nephthys. Osiris became king of the Earth and Isis was his queen.They had a son Horus. After many years of peaceful rule Osiris's brother, Seth, became jealous over his position and eventually slew Osiris to claim the crown for himself. Osiris then ruled the underworld. Horus had his revenge on Seth and defeated him to become ruler of the Earth. The Evolving, Revolving Doors of the Gods. Apart from a brief period of Monotheism introduced by Akhenaten, there were many Egyptian gods. Some, such as Atum, were more human-like with births, deaths and marriage and some were Zoomorphic and represented with the features of animals. There were gods for the sun, the moon, the air; there were gods for fertility, life and the afterlife. And just because they represented one aspect of Egyptian existence didn't mean that they were stuck in that same dull office for all of eternity. Nor were they stuck with the same boring title. Gods changed their roles and even melded with other god's. For example, the god Amun started out as the god of air and eventually merged with the sun god, Ra, to be known as Amun-Ra. There are too many god's to list, and lists are boring anyway, so this is just a sample of some interesting ancient Egypt gods. Amun - King of Gods.